Mother Nature, the trendy diva that she is, never fails to make a bold fashion statement. Whether she is dressed in brilliant, verdant green or muted greys, she confidently dashes across the states calling attention to her stylish spring looks. 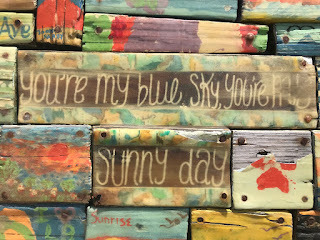 I have been admiring the new poetic forms that are popping up on Poetry Friday blogs and decided that this week, I would try a new form, the nonet, a nine line poem that has 9 syllables in the first line and moves down to one syllable by the last line. I often ponder a new form for days trying to word weave in my head, like I am playing a mental game. Then, I capture my notes and fashion them into a poem. Since fashion is on my mind these days, what with the new flowing florals and lacey tops, I envisioned Mother Nature dressed for spring in the photos I took. The one above was digitized with Waterlogue and the one below was a splendid backdrop for my iPhonography photos. 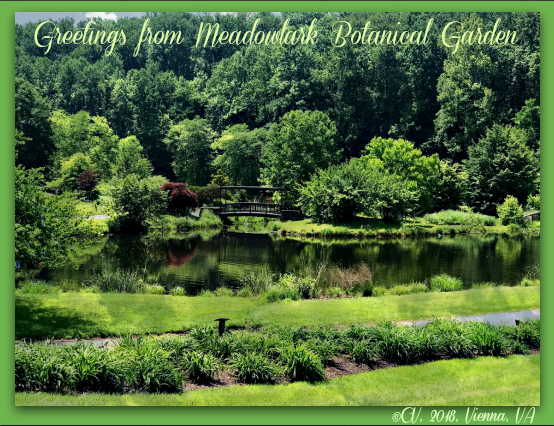 While spring comes in spurts, I was happy to capture this one below while visiting my grandbaby in Virginia. 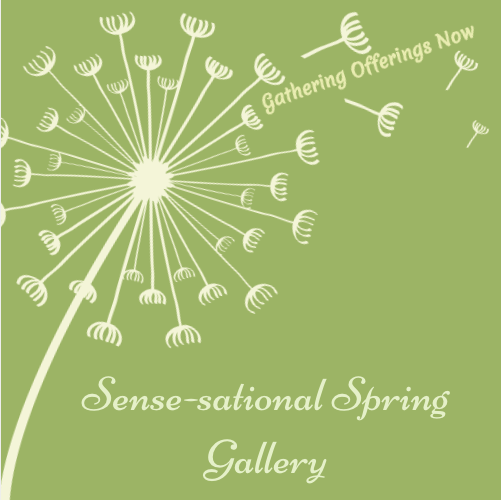 I'm gathering digital offerings like the ones above for my spring gallery, Sense-sational Spring, this week. 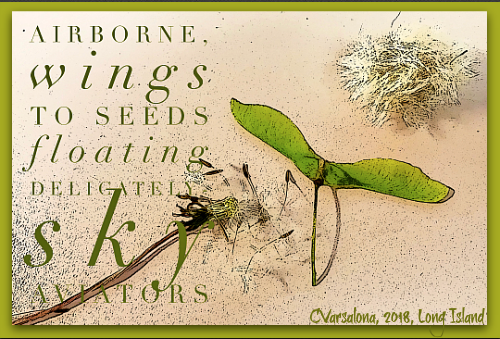 Now off to catch the seed storm photos and poetry at Buffy Silverman's spring-filled blog that you can access here. Buffy is hosting Poetry Friday this week. I wake each day, look out my window, and wonder what will be. Do you do this? At the beginning of the month, Michelle Heidenrich Barnes invited Julie Fogliano to Today's Little Ditty. During the interview, Michelle asked Julie to create a Ditty Challenge for May: stare out the window and write what you see. In response, I have penned three poems. While leisurely planning her artistic play. By mixing her favorite bright, blue dye. Was vividly noticed on my window screen. 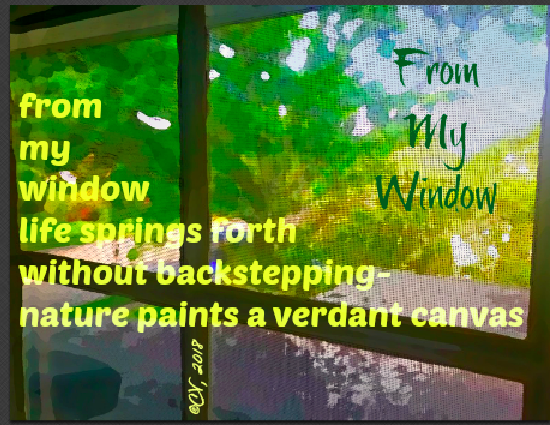 Thank you Michelle H. Barnes and Julie Fogliano for inspiring me to present my poetic perspective from my daily practice of looking out my window. Are you interested in another creative challenge? 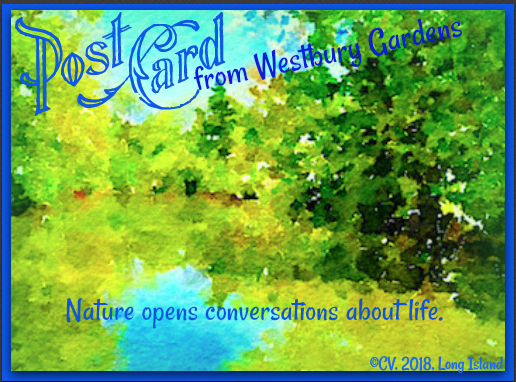 I am collecting digital inspirations, nature photography, inspirational quotes, image poems, spring songs, and artwork for my Sense-sational Spring Gallery of Artistic Expressions that will be unveiled in June. If interested, the invitation with the guidelines can be accessed here. Railroads have played an important role in American history since the early 19th century so when Margaret Simon asked the Poetry Friday writers who would be interested in a photo/poetry exchange, "More Than Meets the Eye," for the May 25th Poetry Friday Round-up, I chose the Long Island Railroad system as my topic. Margaret's guidelines encouraged all to create after close observation and a dash of research. Email an original photo from your geographical area to your partner. Identify the photo specifically in case your partner wants to do some research. Write a poem in any form in response to the photograph you receive. 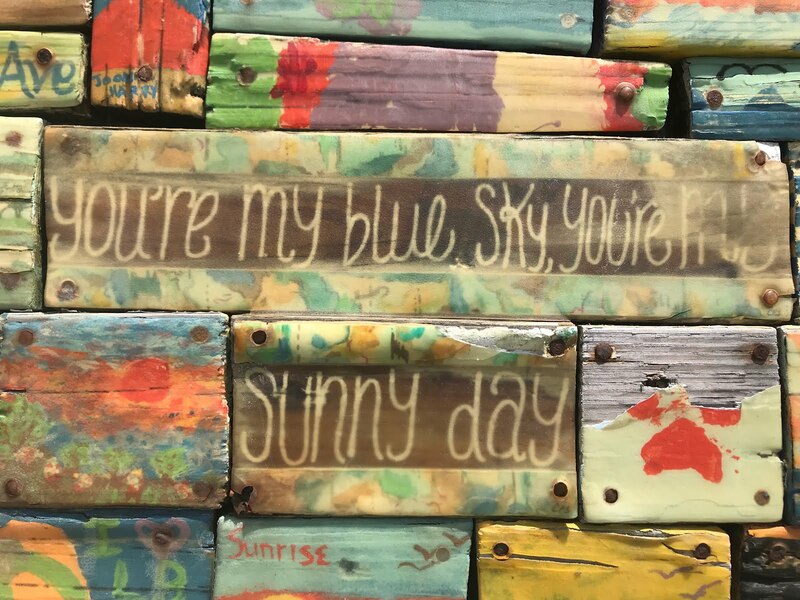 Create a blog post including the photo you were sent and the poem you wrote. Pingback to your partner's blog and link it on my site for Poetry Friday on May 25th. When I found out that Kay McGriff was my writing partner, I was delighted. Kay and I have been involved in various challenges and she often creates image poems for my galleries. I knew that this was going to be a good match but I did not know that it would be a serendipitous one. Both of us without knowledge from the other independently chose railroads as our subject. 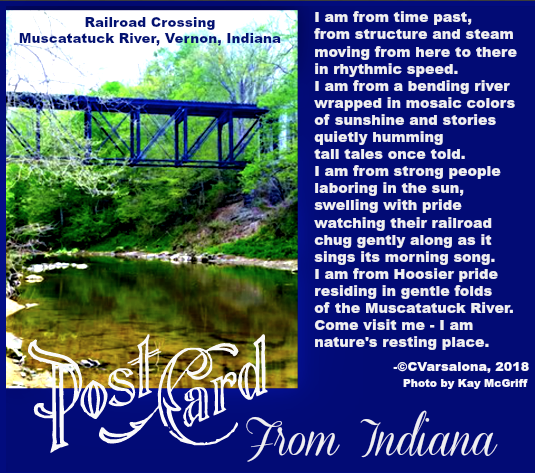 Kay sent me her beautiful photo of the railroad crossing over the Muscatatuck River in Vernon, Indiana first. I wanted to move past my comfort zone so I tried a prose poem followed by a poem that deals with personification and linked the ideas together. To Kay's email, I replied, "Kay, this is so interesting. 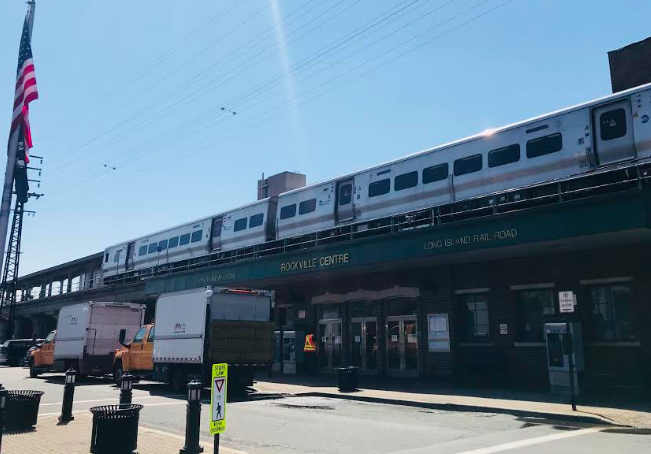 I was planning on sending you a photo of the Long Island Railroad stop because the railroad is one of the prominent means of transportation across Long Island....Serendipity!" I followed this with four photos that Kay could choose as her prompt. Some were from my hometown that is on the western end of Long Island, one of the closest stops on the railroad that heads to New York City. The other was from a town that is mid-island. I am looking forward to seeing which photo Kay chooses. Morning opens sun-kissed and scented with the smell of Hoosier springtime. A softened glow proudly showcases a long-standing railroad crossing. All is silent and still honoring sacred land once trod by Native Americans. 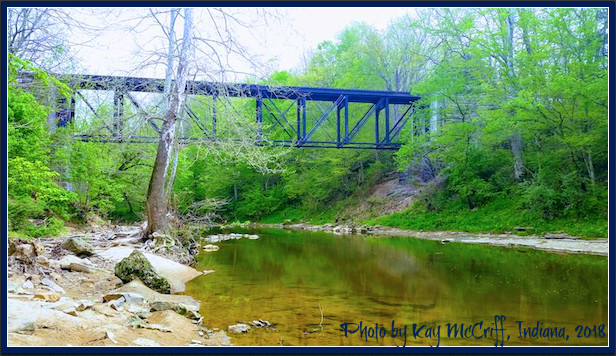 Even the jeweled tones of the Muscatatuck River pay homage to spring's call causing a hazy mirrored reflection. 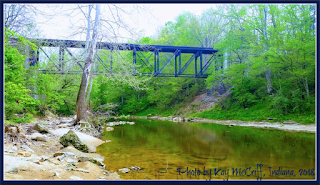 Above a connecting railroad crossing strong and solid stands proudly against the soft river bend that winds its way toward town. There is no sign of a train passing through, yet the woods echo tales retold by retired railroad workers who reside nearby. The river waits at this bend to reawaken history but on this spring morning only a lingering memory of time past exists. Now it is time to see what Kay McGriff is sending me for the "More Than Meets the Eye" exchange program created by Margaret Simon who is also Louisiana's hostess with the mostess for the May 25th's Poetry Friday! 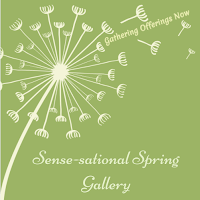 I am gathering spring digitals for my Sense-sational Spring Gallery. It's Sunday morning. For the first time in a week, sunshine covers the sky with softened wisps of cotton puffs. 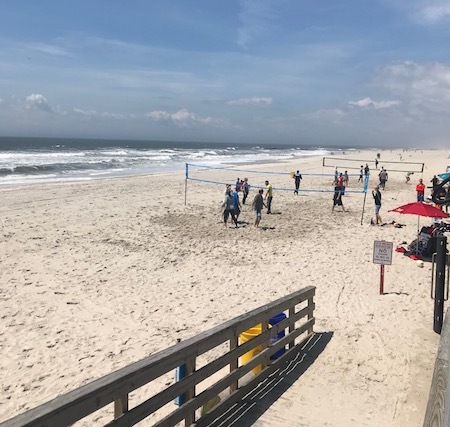 Beachgoers flock to Long Beach Boardwalk to stroll alongside the Atlantic Ocean shore. One of my favorite south shore happiness spots comes alive with springtime joy. What makes this place special? Rising surf rushes to shore in rhythmic patterns as sea gulls silently swoop up and down. Life slows down beachside, below the busy boardwalk. People share their zen-like routines and rituals. Meditative practices are seen everyone from dozing babies and senior citizens on boardwalk benches and in strollers to a lone fisherman basking in the sun. A solitary yogi bows in respect for sun salutations. Serenity is found. Atlantic Ocean beaches are one of my go-to happiness spots. What's yours? 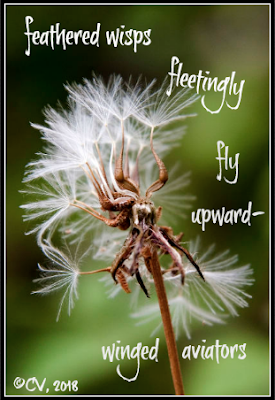 The above poster was shared by Happiness Coach, Kim Strobel, on #NYEDChat last night. The conversation revolved around the topic, The Science of Happiness. You can access the transcript here. It's Tuesday so I am now joining Two Writing Teachers with this slice of life. This post can found on the Wonder Ground at my Wonderopolis Wonder Lead Ambassador site. If you had a wish weed in your hand what would you wish for this springtime? Thank you Terje Akke for the Estonian dandelion field photograph. 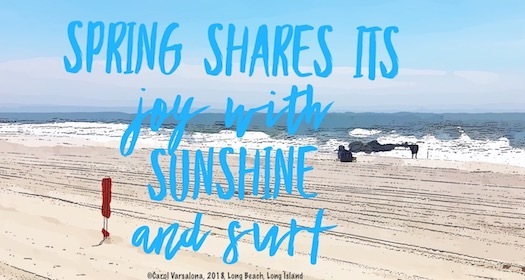 After a week of grey days and rain, the sky opened yesterday to a brilliant sunshiny day that brought crowds of people to the Long Beach boardwalk. A sense of freshness and hope was in the air. There was a buzz on the boardwalk as babies were strolled, bicyclists exercised, teams enjoyed volleyball, and a yogi on the beach greeted the sun. Everyone seemed to feel the need to celebrate springtime under a canopy of the sunshine. As my husband and I walked the boardwalk, we paused briefly to look at the beach artwork. Although we have done this many times, we chose a section that reminded me that the beach filled with sunshine is our happiness go to place. Today, the sun is shining again so I am off for another walk before the final preparations for a happiness happening on Twitter. #NYEDChat, the education chat for NYS educators and beyond, is featuring Happiness Coach, Kim Strobel, as guest moderator. 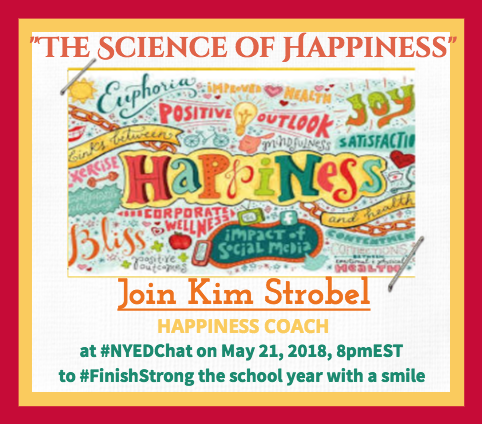 The topic for tonight's chat is "The Science of Happiness" and both Kim and I are very excited about it. In closing, I think back what was last week when grey skies replaced sunshine. Negative thoughts about the weather were voiced, thus leading to slumped over stances and little smiling. While I always say it is best to remain positive, I will now add a new thought from Kim's research findings: happiness is a choice. Celebrate Each Week with Positivity! Happiness Challenge: If you are inclined to brighten the world with a spring digital, whether it is an image poem, nature photo, inspirational quote, or piece of artwork, you may be interested in offering your work for my Sense-sational Spring Gallery of Artistic Expressions. I would like to fill the global online gallery with inspiration so that voice can be carried. The invitation can be accessed here. It just wouldn't be spring without rain showers - BUT - this year's rainy days seem out-of-the-ordinary. Thunder sounds like roaring and pounding; lightning streaks look like a wizard's crop gone haywire; cold, damp rain "chills the bones". One day it is 50 degrees with rain and the next day it is in the 80s with sunshine. On Mother's Day, the sky turned gray and the rains came but that did not stop my husband and me from enjoying the Nassau County Art Museum and its verdant grounds. After taking a photo to remember the day, I turned to Langston Hughes for inspiration. His lovely poem on rain starts with a melodic title and continues with repetitive sentence prompts in each stanza to create a vivid visual scene. 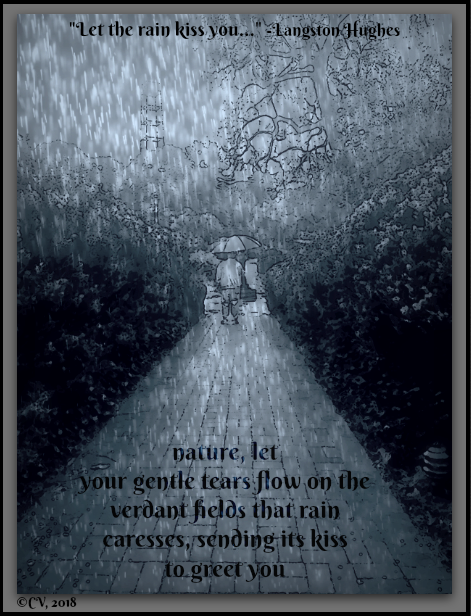 In order to create a golden shovel poem from the first line of Hughes' poem, I felt I needed to add life to the rainstorm we were caught in, so I digitized my original photograph taken on the museum grounds. I used the app Mobile Monet first to give the photo more of a dramatic look on the grey, rainy day. Then, I chose PicMonkey to create the final image with enhanced rain. Finally, I backtracked and started noticing more of the details in the scenery and wondering how to craft the poem. While many are perplexed by the weird weather patterns we are having, I am intrigued. 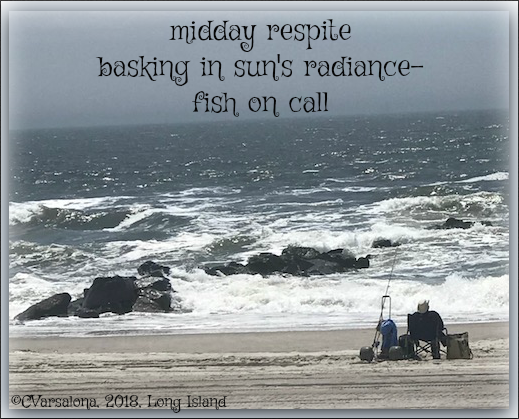 Mother Nature appears to be enjoying her seasonal play time this year so I am trying to capture the many faces of spring for my Sense-sational Spring Gallery of Artistic Expressions. 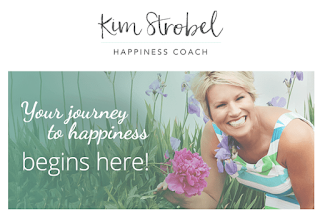 Will you join me in creating poetic offerings? Today, the Poetry Friday Round-up is hosted by my writing colleague, Rebecca Herzog at her blog site, Sloth Reads. Stories hold our thoughts, heartbeats, and deep-seated feelings. They share what is the best of what we want or need to say. For centuries, storytelling has been a long-standing tradition. Stories have changed forms as they were passed down from generation to generation. Some stories have been told in song. Others were written in prose or poetic form. Today, I share my stories at this blog site, my contemporary storytelling cache where I have housed many global galleries of artistic expressions. 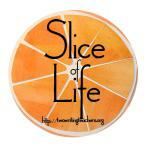 It's Slice of Life Tuesday at Two Writing Teachers where many stories are unfolding. Please peruse a recent global story of Lady Winter that unfolded at my blog site, Winter Wonderland Gallery. 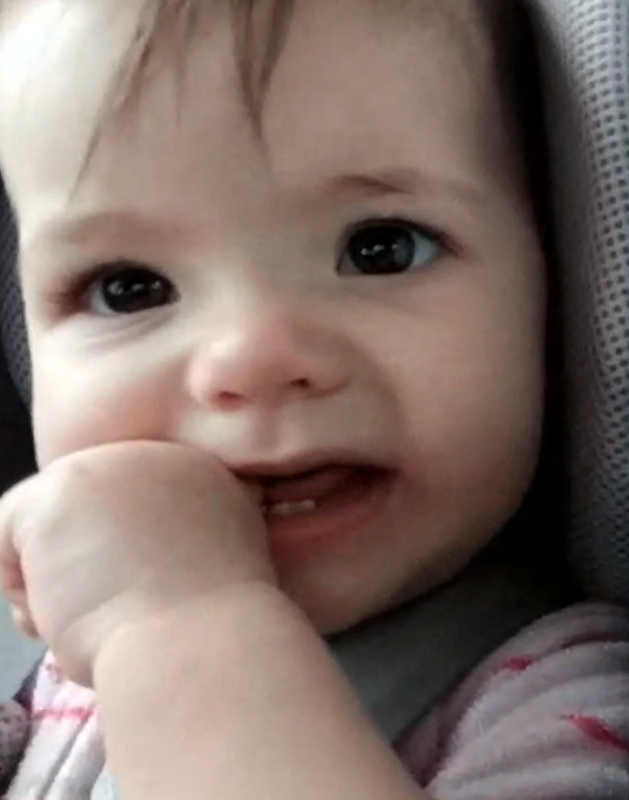 Saturday morning opened with the sweet sound of birds calling to one another and a Google Hangout with my grandbaby. 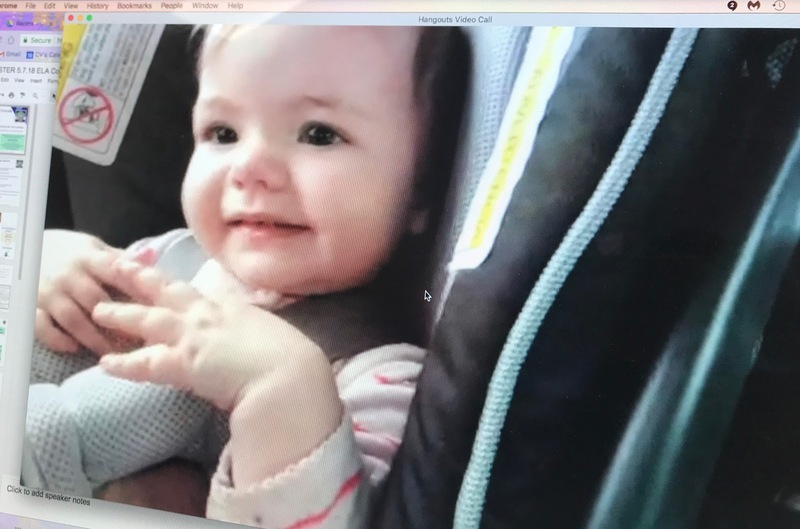 It's Mother's Day Weekend and I feel lucky that technology has shortened the distance between Virginia and Long Island so that I can spend some time with my little grandbaby. Isn't that wonderful? Via Google Hangout, I was able to see Sierra eating her breakfast, waving to my husband, son, and me, and enjoying her first hand clap. Later, I saw Sierra trying out her new crawl move. With great joy we all applauded her efforts. Beside all of this, I found a surprise from Google Photos. A Mother's Day video card was ready to be uploaded with my permission. Below you will find the wonderful photo tribute for my daughter's first Mother's Day. Google also created a video card for me too. You can see it here. Happy Mother's Day wishes go out to all of my face-to-face and virtual friends. May the peace of Mother's Day fall upon you as you listen to Celine Dion's beautiful song, A Mother's Prayer. Step out in style tomorrow. 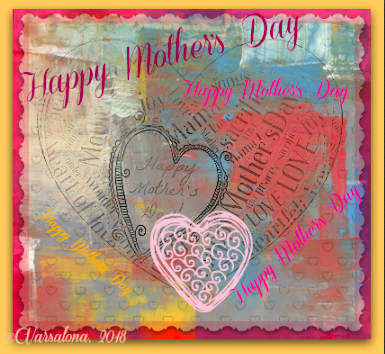 Celebrate Mother's Day! I hope a sense-sational spring day awaits you. 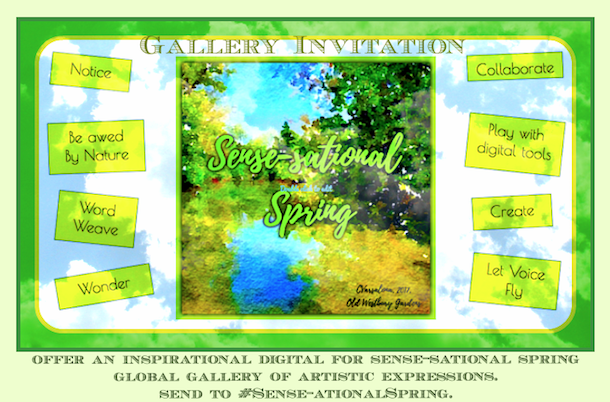 I am collecting digital offerings, nature photographs, image poems, inspirational quotes, original music, and artwork for my upcoming global gallery of artistic expressions, Sense-sational Spring Gallery. Each weekend I celebrate the week with Ruth Ayres and her community of writers at Celebrate This Week. How did you celebrate your week? Spring unveils itself as a season of hope. It reawakens earth, lifts spirits, and calls all beings back to nature. 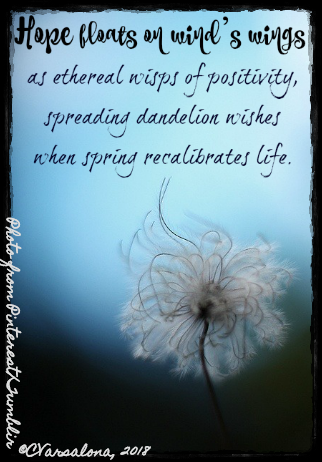 Spring is filled with hope evidenced by the blossoming of life. We cannot reach out and grasp hope but we can accept the spirit of possibility it offers in springtime. Hope is needed in this world of change and flux. Finding and spreading it is a call to action. 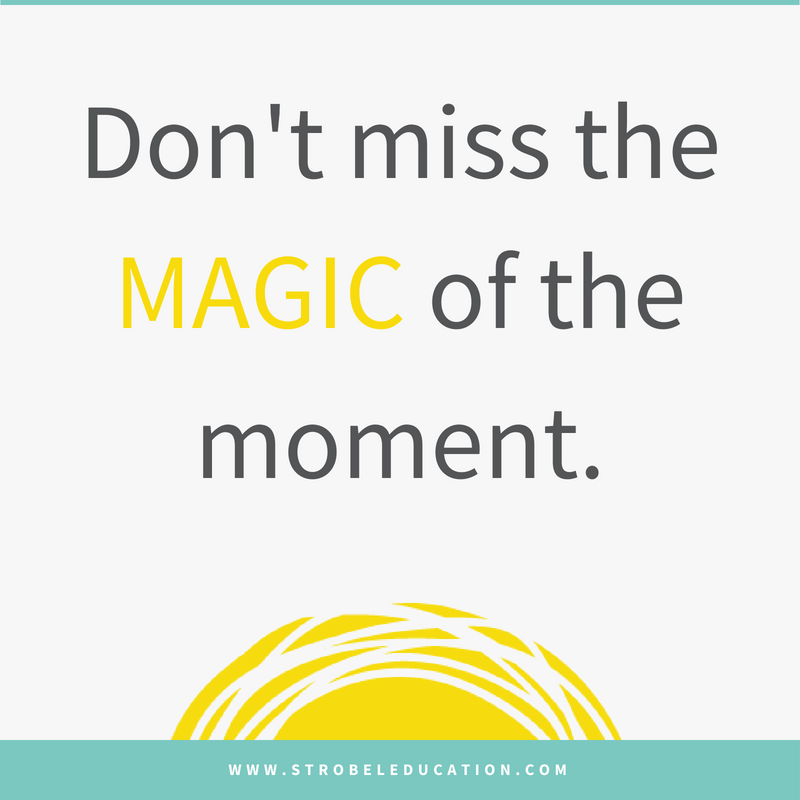 Tonight, #G2Great offered an inspirational chat, Teaching Hope to the Next Generation. Since it was due time to check in with my one word, hope, I joined the chat to voice my thoughts with my colleagues. My friend, Dr. Mary Howard, opened the conversation with a confirming statement, "We need more HOPE in this world and that begins with our children who will lead the way. We have to make that a priority in our schools and classrooms." Agreeing with this statement, I added that building, cultivating, and sustaining cultures of trust and hope is essential. 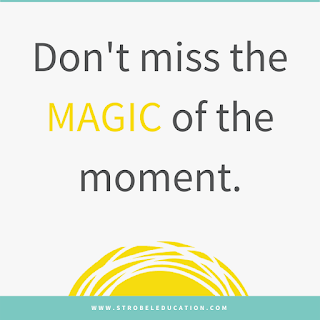 Classrooms must become havens of joyful learning and educators, as ambassadors of hope, need to bring the spirit of possibilities to all our students. In turn, they need to help students believe in their unique selves in order to find their greatness. The ending challenge of #G2Great asked us to state how we would become ambassadors of hope this week. What would we do to spread hope to our students or colleagues. Being a change agent is important to me so I said that I would take up the challenge by creating a digital inspiration to spur others to believe in possibilities. I created the above digital inspiration by appsmashing using PicMonkey and FotoJet. #G2Great shared this beautiful digital titled,Teaching Hope to the Next Generation. The first stanza of Emily Dickinson's poem is here. You can read the rest of the poem at Poetry Foundation. You may be interested in listening to these videos. Today the Poetry Friday Roundup is hosted by the amazing Jama Rattigan. Please join me at Jama's Alphabet Soup that offers an eclectic feast of food, fiction, folderol and chewy culinary verse. 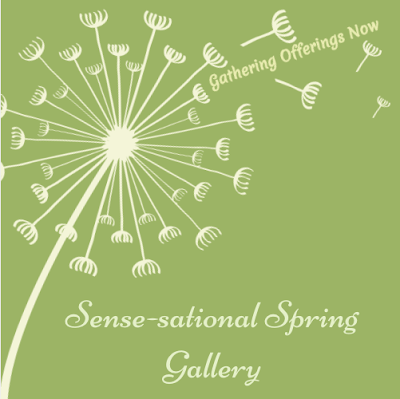 I am collecting offerings for my newest gallery, Spring-sational Spring, and hope that my Poetry Friday friends will grace the gallery with their inspirational digitals. I am adding the 2018 Progressive Poem with the names of the 30 contributors to the spring gallery. 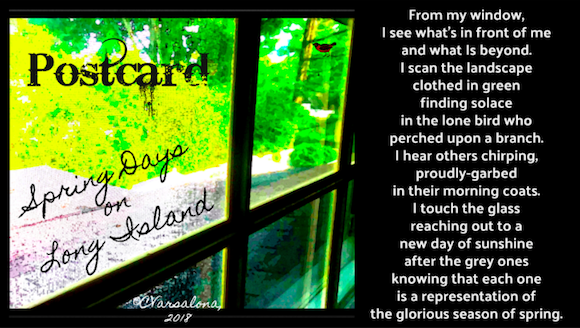 Another weeklong celebration of spring, has inspired me to notice my surroundings in a new way. 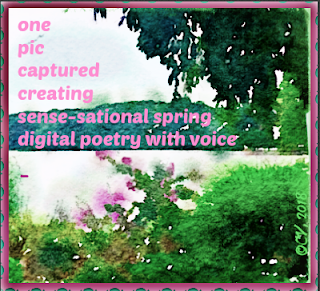 From the stance of an observer, I reflected and created #digipoetry (digital poetry) for my upcoming global gallery of artistic expressions, Sense-sational Spring and the family's Google Photos album. So Just What Is New? I channeled my emotions to create a poem of feelings. via Google Hangout because she lives 5 1/2 hours away. I love watching her grow. 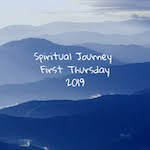 I offer this post to both Ruth Ayres' weekly site Celebrate This Week and Two Writing Teachers' Slice of Life to connect with my writing colleagues. May each person who reads this post, celebrate spring in your own special way and enjoy your Mother's Day. I have been waiting for there to be a full week of warm weather to color my world spring. This week, a mix of spring and summer weather, brought out the best of neighborhood liveliness. Evidence of this was baby stroller sightings, children frolicking in the school playrground, family bikers guiding their children in their new training wheels adventure, and yogis meeting in the yoga studio. 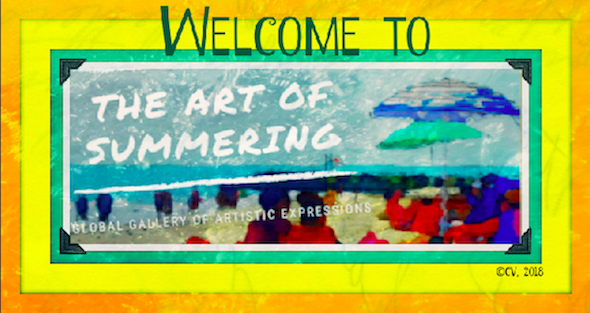 I wanted to share the excitement of spring in a vivid, expressive way to bring the effect that weather has on people's psyches. I decided that digital art and poetry would be the best format to combine what I see, hear, and smell on spring days. I started with taking photos of an early morning view of nature from my window. My ordinary morning shot needed to be enhanced to convey my sentiments so I turned to appsmashing. I tried several platforms to find the right mix. Staring into my new digitized photo (above) allowed me to think of various words to describe what I felt. 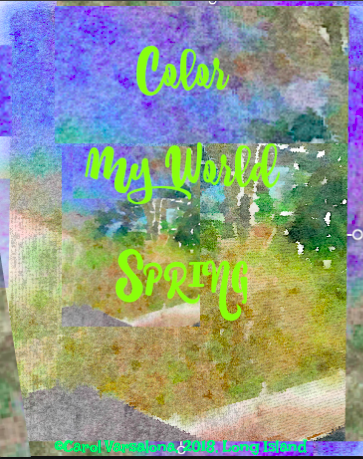 Attending my yoga class, experimenting with language, and just simply playing with different formats of poetry brought me to the final stages of my color my world spring digital inspiration incorporating the various emotions I felt this week. it takes its origin from emotion recollected in tranquility." I'm adding my thoughts to the Poetry Friday Roundup. My poet friend, Brenda Harsham is hosting today with her Starry, Starry Spring poetry. 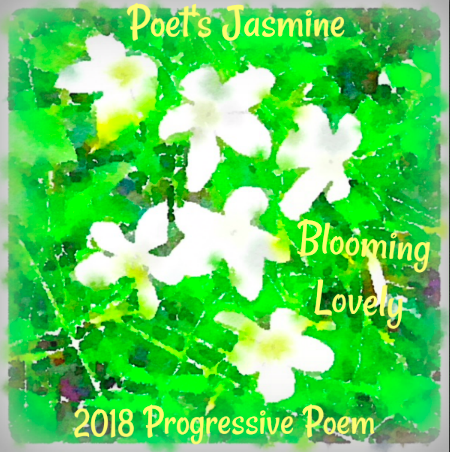 Please see the 2018 Progressive Poem, Poet's Jasmine: Blooming Lovely, that was created by 30 different Poetry Friday poets. You can access it here at Irene Latham's blog site. Irene started the tradition of writing the progressive poem during National Poetry Month in 2012. I created this digital for the poem. 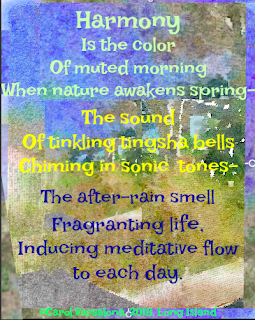 You can see the poem and others at my upcoming newest gallery, Sense-sational Spring.